We can supply and install manual or motorised ZipTrak awnings in a range of colours and materials. This patented awning offers a specialised side guide system. The edge of the blind is guided closely in the side tracks and this provides a closely sealed environment to exclude weather and insects. With a balanced spring the awning can be stopped at any position. We can supply our Ziptrack awnings in a variety of materials and custom colours to suit your situation. Awning skins can be made from long lasting colour fast polyester/nylon blends, acrylic or canvas fabrics in either water resistant or water repellent grades. Where it is required we can have the frames and fittings powder coated to match existing property colour schemes. Our components are locally sourced in Queensland. Ziptrack awnings operation can be manual or motorised. Motorisation is wired into one of the household 240v supply circuits. Operation is provided via a fixed control station or a hand held remote. 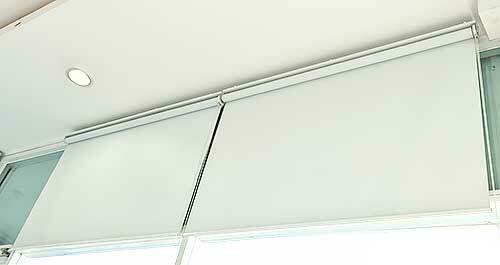 Ziptrack awnings can be controlled through a single controller. With advancement in technology we can provide and install sensors that can sense light and wind speed and operate the awning to provide shade as well as retract in adverse weather to protect your investment. The benefits of Ziptrack awnings include cutting down the heat, reducing household bills, reducing fading on furniture and carpets, allowing windows to stay open in rainy weather as well as increasing privacy.